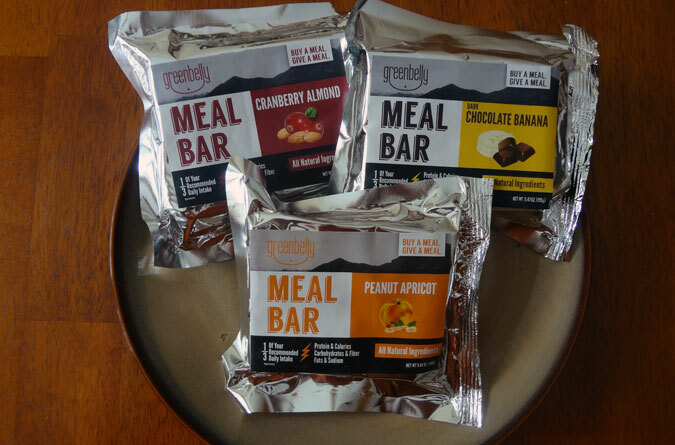 Greenbelly meal bars provide a third of your daily nutrition. Plate, fork, and knife not included—or needed. Meal planning is arguably the most difficult aspect of backpacking preparation. Whether you plan on hitting the trail in Maine or Georgia, in snow or humidity, rain or wind (likely both), there’s an abundance of clothing and gear options to keep you comfortable and on the go. Food is different. For starters, you’re limited to editable items that can survive the beating in a backpack, keep from spoiling or freezing in the aforementioned conditions, and aren’t weight prohibitive. From this limited shopping list, you must find the proper nutritional balance to fuel a 20-mile day or the rigorous ups and downs of the Mahoosuc Range. The real challenge, however, is knowing what’s going to tempt your taste buds for days, weeks, or months on the trail. Energy bars seem good at first but are quickly loathed, freeze-dried meals never quite come out “right” and eventually loose their taste, frequent town shopping gets expensive and time consuming, and make-your-own dehydrated meals takes a significant amount of off-trail preparation. All of which adventurer and Greenbelly founder Chris Cage experienced firsthand while backpacking through Asia, bicycle touring New Zealand, and thru-hiking the Appalachian Trail. Fed up with inadequate options to feed himself, he set out to do something about it, and Greenbelly was formed. This may sound familiar to anyone who has read the back of a Clif Bar wrapper. Where Chris’ path diverges from the somewhat clichéd created-an-energy-bar-in-mom’s-kitchen storyline is that he set out to develop a meal bar, complete with a third of the recommended daily allowance for calories, carbohydrates, protein, fats, sodium, and fiber. His success is worth trying for yourself. The first bite of a Greenbelly meal bar is surprising, because mentally you’re prepared for the condensed mass typical of energy bars. Greenbelly, on the other hand, has the taste of flavored GORP with the pleasant consistency of a Rice Krispies treat. The flavors currently available are Cranberry Almond, Dark Chocolate Banana, and Peanut Apricot. While I’m particularly fond of Dark Chocolate Banana, there isn’t a bad option in the lot. At 27 percent of the recommended daily value, only sodium in the Chili Mac approaches the 33-percent threshold, while all of the above categories (excluding sugar) meets or exceeds the 33 percent for Greenbelly. The total carbohydrates and sugars also make it plain to see that Greenbelly is intended to be consumed amidst high-exertion activities and not, say, for lunch while sitting at your desk—something I only did once, don’t judge. For those who are pack-weight conscious, the Greenbelly Chocolate Banana is listed at 5.47 ounces on the package, and my scale rounds it up to 5.5. This is slightly above the Mountain House Chili Mac weight of 4.06 ounces on the package, 4.8 on my scale. The Greenbelly bars don’t require a stove or fuel, which begs the question: Could you subsist on the trail solely on Greenbelly? Probably, but the better question is: Would you want to? Probably not. While Greenbelly solves my biggest stomach turn with the energy bars—the thick consistency—all things are best in moderation. That said, Greenbelly deserves a place in trail meal planning. The bars are perfect for long weekend getaways when you want to cut stove/fuel weight; as a mid-day meal on longer hikes; or as dinner on those days when you want to forge ahead for more miles in the dwindling daylight, or want to immediately dive into a shelter and sleeping bag to get out of the rain. Greenbelly meals can current be purchased in packages from three meals to 144 through the company’s Kickstarter campaign. 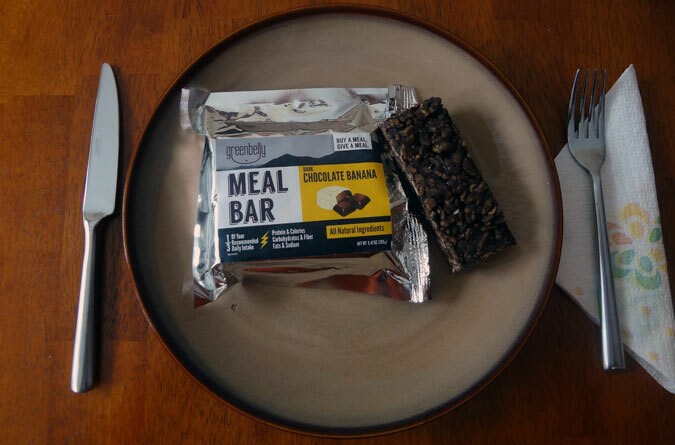 For every meal bar sold, Greenbelly donates a meal bar to the Atlanta Community Food Bank, and a portion of the proceeds go to the Leave No Trace Center for Outdoor Ethics. Disclosure: Northeast Hikes was provided Greenbelly meal bars for the purpose of this review.